“I used to think 600 acres was a decent size of farm but it’s become pretty average in recent years,” said Mr Simpson, adding that changing farm size perceptions make the sort of collaboration and co-operation he’s involved in increasingly important in today’s agribusiness climate. Commenting that it would be good to expand on his existing 600 acres at Castlemains, Dirleton, if the right opportunity arose, he stressed that balancing labour and machinery requirements against what such an expansion could justify would always be a critical factor. Adding extra acres, for example, would almost certainly require an extra man to be employed and additional machinery bought. He’s found, however, that working in collaboration with half-a-dozen neighbours in such circumstances creates other options. “It gives us greater ‘unity of strength’ and the potential to take on bigger projects,” he said, referring to his well-established involvement in Law Farmers, a local co-operative of six farmers which he joined in the early 1990s. Mr Simpson accepts that being part of a pretty compact co-operative, as Law Farmers is, requires a huge amount of trust and flexibility between the six members. Based on almost 30 years’ experience of working together, however, he’s entirely confident with the process. “We’re all roughly the same age, played rugby together and attended the young farmers events together,” he said. “That was the background against which the co-operative was set up, plus the fact that while there were clear differences between our businesses, there were also many similarities. “As a result, one member took on the buying of fertilisers on a group basis, I did the same with our fuel requirements, and so on. The next decision was to go into contract farming, with the members first deciding to buy a group combine, before adding a second later on. They’re currently used across nine contract farmed units. “I still have my own combine, as do others in the group, but I know that if I need extra capacity, or if mine broke done, then the extra units are available,” he said. 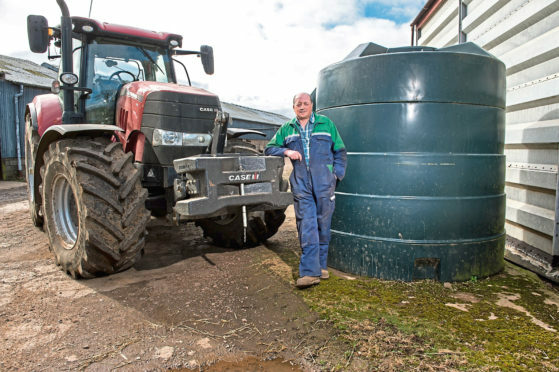 “They’re not a massive benefit to me but I guess they’re our version of having a ‘backstop’ in place, in a farming sense that is. Mr Simpson is also part of two other co-operatives, having joined the East Lothian Potatoes Group 15 years ago, and Scottish Borders Produce, a specialist pea group, almost three years ago. “I no longer produce potatoes myself, preferring to rent out about 45 acres to another grower,” he said. Adding co-operative number three to the Castlemains business three years ago means the farm’s 37 acres of peas are also now managed on a group basis, being supplied to the group’s freezing plant in Eyemouth within an hour and half of them being harvested. “Being part of all three co-operatives has allowed us to increase the efficiency and profitability of our overall business in so many ways,” said Mr Simpson. “Key benefits include sharing costs, savings on fuel and fertiliser collectively and greater bargaining power when selling our output. “There are always better prices available when you buy and sell in bulk. “It’s the same with peas, which we now sell as part of a 35-grower / 4,000-acre operation and potatoes which are sold as a 7,500-tonne lot rather than our previous 700 tonnes.